‘What’s for dinner Mum? We want pizza!’ Who hasn’t had their family requesting a meal that would normally mean a quick dash to your nearest pizza parlour? With a well stocked store cupboard you can have a piping hot pizza or two in front of your family without even taking off your slippers. These days you can purchase ready-made pizza bases in family and individual sizes. Found near the pasta and Italian food section in any supermarket these are packaged ready for the store cupboard and for any tasty topping you wish to add. You may not want to make a pizza base from scratch but take a look at the ready to make bread mixes, most of them are suitable for turning into pizza bases, loaves or rolls but for a quick meal these would still take time to prepare and prove. If you have a bread making machine it is possible to make pizza dough in less than one hour. Tomato sauce seems to be the basis of every type of pizza topping. This is so easy to prepare – in fact keep some jars of passata in your store cupboard and don’t even bother trying to make the sauce from scratch – there are far better things to be doing with your time! Pureed garlic paste, peppers and spices can perk up the plainest of passatta or tins of tomatoes to make a tasty pizza sauce. Barbecue, chilli and other such sauces are always available in any good food shop and by having a few of them in your cupboard they will enhance many meals as well as a pizza. Common sights on pizza are olives and anchovies. Both these items can be bought in cans or jars ready for use. Younger members of the family may not be quite so keen on these foodstuffs so why not make two pizza or divide a large one into different portions for different members of the family. One small chicken fillet can be cubed and cooked in minutes in a wok or frying pan. If you have a ham or beef joint freeze a portion of the cubed meat ready for a tasty pizza. Several sausages can be grilled or fried then sliced ready for your pizza. 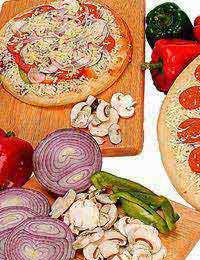 Take a look at your supermarket’s pizza display and make a note of the type of vegetables and fruit used on their pizza. Some, like sweet corn and pineapple, can be kept in your store cupboard in cans. But, it is also possible to purchase bags of frozen peppers, onions even mushrooms that are ready for use as soon as you take them out of the freezer. Most of us keep at least one type of cheese in our fridge and it is usually a good strong cheddar which is suitable for grating over the family pizza feast. Other cheeses such as parmesan, mozzarella and feta can also have a good shelf life for the fridge so if you think your family will be requesting a pizza in the next few weeks stock up with these as well. Olive oil drizzled on a pizza is so tasty. Rather than stock one bottle why not have some of the smaller bottles that are flavoured with such things as garlic, lemon and herbs. They brighten up many meals. Preheat your oven to 210 degrees C or gas mark 7.Place your pizza base onto a flat baking tray. Spread with your chosen sauce making sure not to get too close to the edges. Next add meats and or vegetables and fruits. Top with cheese and drizzle with oil. Add anchovies and olives if desired and place in the top of the oven for around 15 minutes until bubbling and cooked. Why not lay out all the ingredients and have your family make their own favourite individual pizza? Have a pizza party for the children and even try stuffing the crusts just like they do in all the best restaurants. Pizza making can be fun.